Sign up using the form below or call (714) 963-0440 to make an appointment. Brook-Ellis Pet Hospital is dedicated to offering quality and personalized veterinary care. 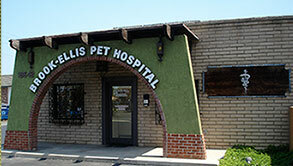 Brook-Ellis Pet Hospital was built in 1972 by Dr. Wayne Kopit's father, Harold Kopit, DVM. Dr. "Wayne" helped design the hospital and worked for his dad while still in High School. Dr. "Wayne" then officially assumed ownership in 1985, where he has served the health needs of several generations of family pets. At Brook-Ellis Pet Hospital, we treat your pets like the valued family members they are. With the recent legalization of Marijuana in the state of California, a lot of pet owners have questions about CBD, and Hemp products for their pets. We have provided some information to address any questions or concerns you may have. Please click on the link below. We are excited to partner with Trupanion and offer you the convenience of Vet Direct Pay! We can now submit claims electronically at checkout, so if your pet is covered by a Trupanion policy, you can skip the traditional claims and reimbursement process. You can pay only your portion of the bill (as little as 10%) — Trupanion pays the rest of the balance directly to us at checkout! Contact our office for details! Medical insurance for pets can help you pay for unexpected illnesses and injuries. Trupanion can cover a significant portion of your veterinary bill (up to 90% of eligible costs*) in minutes. With a Trupanion policy, our clients often pay only their part of the bill at checkout and leave the hospital without waiting for claim approvals and reimbursements. You can learn more about Trupanion coverage and direct payments at Trupanion.com. Dr. Wayne Kopit graduated from the U.C. Davis School of Veterinary Medicine in 1984. He then completed a rotating internship in radiology, internal medicine and surgery at the California Animal Hospital in 1985. Dr. Kopit took over Brook-Ellis Pet Hospital in October, 1985. Dr. Heidi Tschauner (Dr. 'Heidi') graduated with honors from Ross University, School of Veterinary Medicine in 1991. She completed a one-year internship in small animal medicine and surgery at New York's prestigious Animal Medical Center in 1995. Dr. Tschauner joined Brook-Ellis Pet Hospital in 2002. Jenn has been the Office Manager at Brook-Ellis Pet Hospital since February 2008, and has been working in the Veterinary field since 2001. She enjoys spending time with her husband, camping, traveling and photography. Jenn has 2 cats, 'Norman' an orange tabby and 'Jax' a brown and white tabby short haired cat. Debbie has been with Brook-Ellis Pet Hospital since 1994 and has been working in the Veterinary field for over 25 years. In her spare time she enjoys fishing with her family and friends. Debbie has two cats at home named 'Noodles' and 'Kharma'. Debbie completed her Veterinary Technician courses in April of 2004 and passed her CA state board exam in July, 2004. Fidel began working at Brook-Ellis Pet Hospital in August of 1995. He started in the veterinary field through ROP classes in high school. When he isn't at work, he enjoys fishing, BBQ'ing and archery. His favorite cat breed is the British Shorthair and his favorite breed of dog is the Brussels Griffon. Ignacio joined Brook-Ellis Pet Hospital in 2008, after completing veterinary assistant school. He is the proud owner of 'Hennessey' a four year old Siberian Husky.